Hua Hin Beach is a seven kilometre (three and a half mile) long, wide and flat stretch of uncluttered coastline with plenty of room for you to relax in the sun. You can enjoy a variety of water sports, take a leisurely pony ride or simply go for a long slow stroll along the beach. The resort town of Hua Hin had derived its very name from the headstone rock formation that you can see on the beach in front of the luxurious Sofitel Hotel. Hua Hin is the oldest beach resort in Thailand and has been a firm favourite destination of the Royal family for hundreds of years. Bare in mind though that there are many more stunning beaches in Thailand than Hua Hin beach, but should you prefer to get away from the more crowded hot spots and want to be a little closer to Bangkok, then this would be an ideal beach destination. Although there are a small number of girly bars here, there are not nearly as many as in the resort towns of Pattaya or Phuket. Should you wish for a more peaceful vacation, then perhaps this could be another good reason to visit Hua Hin. Whatever your plans might be, don't leave it for too long, though, as knowing Thailand's reputation for rapid development, Hua Hin could easily become another Pattaya. For two days and one night, you can explore Wanakorn National Park, located midway between Prachuap Khiri Khan and the Nam Tok Huai Yang National Park. Wanakorn has a long stretch of beautiful beaches with breath-taking views, fine quality of white sand, plus lines of Common Ironwood and Ironwood Horsetail dotted along the shoreline. 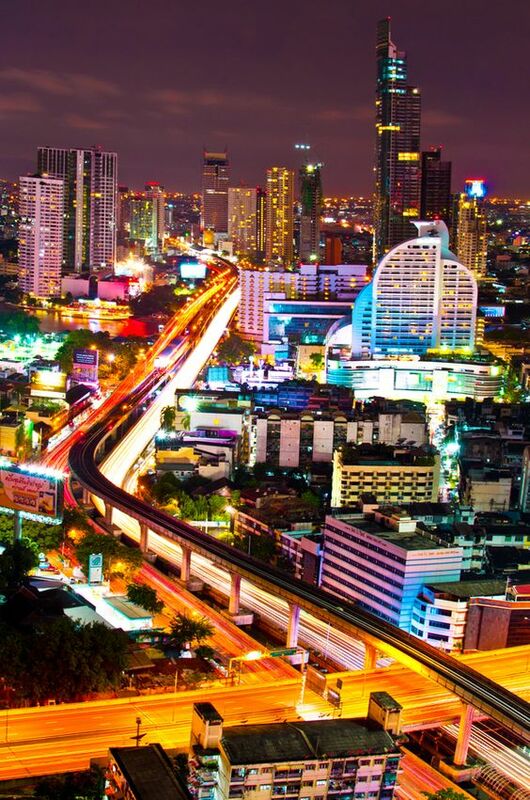 The park is the smallest in Thailand and consists of a narrow coastal plain which stretches from the coastal line. While there are mostly deserted beaches as well as plentiful bird spotting opportunities, the verdant atmosphere here promotes a high level of relaxation. Thaisi and Chan are two neighbouring islands here, while Klong Hin Chuang is the only water brook that flows in the park though it sometimes runs dry at times during the drought. Moreover, places worth visiting are Thaisi Island, (the main hub for swiftlet nest collection) Chan Island and the Khoi Gardens. Unfortunately, permission from the national park office is needed prior to coral reef scuba diving. Cha-am Beach is about 30 kilometres (20 miles) north of Hua Hin and characterised by a long row of Casuarina trees on the beach side of the road and an equally long row of stalls on the other side of the road. Here you will find local vendors selling seashells, sunglasses, sun hats, sandals and squid... Well, actually just about anything and everything. Cha-am beach is uncrowded during the week where you can relax in private under the shade of the Casuarina trees, take a swim in the warm waters or hire a jet ski and have a blast. But on the weekends it is the Thai holiday atmosphere that prevails and can be a little crowded as many locals descend onto the beach. How would you like to learn kiteboarding on a one on one with highly experienced and multilingual IKO certified instructors in Thailand. There's no better way to discover this fast-growing watersport than through one of the course options here designed specifically to fit your every need. Please see above for more details. Whether it be the 1-hour Discovery, the 1-day Introduction or the 3-5-day beginner kiteboarder course. Upon completion, you'll be award with a personal IKO kiteboarder card that signifies your level based on your capabilities. Once you become an IKO qualified "independent" kiter, you may show this card at any IKO kite centre in the world and this will allow you to rent equipment or continue learning from your level if not yet independent. 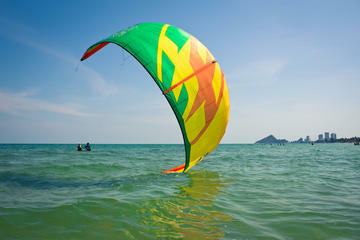 Enjoy your kite-surfing holidays at the popular seaside resort of Hua Hin. 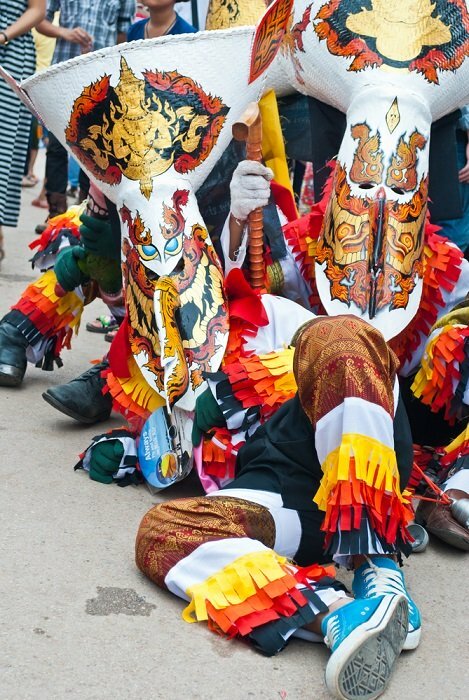 It's a refreshing mix of city and sea with its lively markets, Buddhist's temples, street food and activities. Suan Son Beach is a beautiful stretch of beach that derives its name from the sun and the Casuarina trees which line the shores. Belonging to the Army Welfare Office, this beach was originally established as a retreat for soldiers and veterans but it is now open to all. 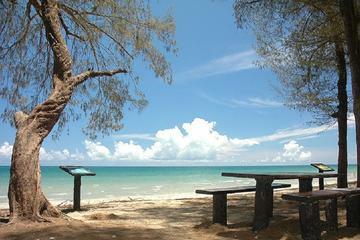 The beach is set in a secluded location and is less crowded than its near neighbours. You can spend your time just unwinding and relaxing in the cool breeze under all that shade. Once you have had your fill of fun in the sun you can pop along the way and enjoy a tasty meal in any one of the many restaurants in the area.